The introduction of Godzilla in 1954 was a masterstroke. The monster directly tapped into the fears and anxieties of the Japanese populace following the American atomic bomb attacks on Hiroshima and Nagasaki, and the potential ramifications of the nuclear fallout. The popularity of the iconic character was instant, while the enduring legacy of Godzilla has remained due to the still underlying apprehension surrounding nuclear technology. Ironically, a similar fate was to occur with neighbouring South Korea. In 2000, the American military dumped 20 gallons of formaldehyde into drains which flowed directly into the Han River, the source of drinking water for the entire population of Seoul. The enormity of the public outcry was such that the U.S. military gave it’s first public apology since the Korean War, yet it did little to assuage public opinion. Enter The Host (괴물), a film that – similar to Godzilla – uses the true story as a basis for a narrative which introduces a monster into the midst of Seoul, amalgamating the fears, angers and anxieties of the society into the monstrous beast. ‘괴물’ is translated as ‘monster’, the source of the horror. However, far more interesting (and multi-layered) is the English title ‘The Host’. ‘The Host’ refers to the Han River which harbours the monster, but is also symbolic of Korea for ‘hosting’ the U.S. military (arguably another source of ‘horror’ due to creating the monster and perceived imperialism). The multi-layered title is reflected within the narrative, and it is such complexity that makes The Host one of the best science-fiction films of all time. The Host depicts the dysfunctional Park family, who are more a collection of individuals due to their differing personalities and interests. The slacker of the family, Gang-du (Song Kang-ho (송강호) works at a convenience store with his diligent father Hee-bong (Byeon Hee-bong (변희봉) on the banks of the Han River. Living with them is Gang-du’s daughter Hyun-seo (Ko Ah-seong (고아성) a middle school student who dislikes her father’s laid-back attitude. One day whilst serving customers, a mutated amphibious fish monster emerges from the river wreaking havoc. Gang-du and an American soldier bravely try to stop the monster from eating people, but during the struggle the soldier is gravely injured as the monster tries to consume him. Wounded by Gang-du, the monster runs back to the safety of the Han River and snatches the unaware Hyun-seo on the way. With Hyun-seo believed dead, the Gang-du is joined by his salaryman brother Nam-il (Park Hae-il (박해일) and archer sister Nam-joo (Bae Doona (배두나) in mourning. However, the American soldier is reported in the media as having a new strain of disease due to contact with the monster, and the military immediately incarcerate and quarantine the entire Park family against their will. That night, Gang-du receives a phone call from Hyeon-seo who is trapped in the monster’s sewer lair, and as the military refuse to help, the Park family resolve to escape their imprisonment and find Hyeon-seo before it’s too late. Director Bong Joon-ho (봉준호), who also co-wrote the film with Ha Joon-won (하준원), Joo-byeol (주별) and Baek Cheol-hyeon (백철현), has crafted a magnificent and multi-layered film that examines an incredible array of socio-cultural anxieties within Korean society. The Park family are a microcosm for the disparate identities and labour forces within Korea. 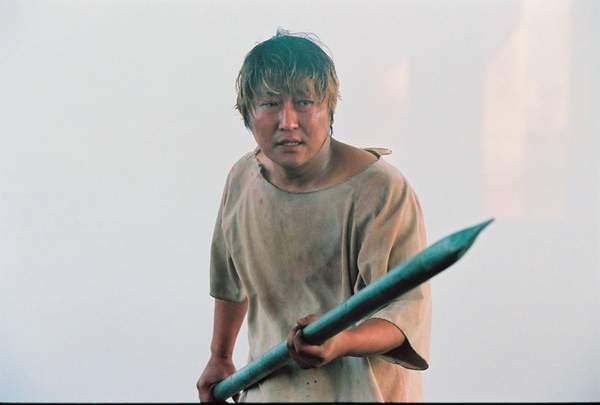 Grandfather Hee-bong represents the hard-working older generation; Gang-du exemplifies the manual labour force; Nam-il constitutes the university-students-turned-office workers; Nam-ju represents women in Korea, hesitant to display their power and talent; and Hyeon-seo embodies the innocence of the younger generations. As such the family unit is allegorical of Korea itself, emphasising that for the family/Korea to succeed in killing the monster and saving their daughter/youth, they must forgo their differences, come together and work as one. The ‘monster’ the family must defeat is somewhat ambiguous. The mutated animal is the most obvious example, yet the media is equally as monstrous in inspiring panic throughout the citizens of Seoul, reports which are ultimately lies. Behind those lies are the American government and military who use the panic to their advantage, expanding American influence/imperialism and releasing ‘Agent Yellow’ (a not-so-subtle reference to toxic Agent Orange) into the atmosphere, which does little except to add further poison to the atmosphere. Korean society is also interrogated by depicting bribery and the traitorous actions of office workers due to their escalating debt. Director Bong Joon-ho (봉준호) continually references the multitudinous ‘monsters’ the family confront through a variety of representational devices, serving to add astonishing political and socio-cultural depth within the narrative. The blending, and subversion, of genres is seamless. Most science-fiction films tend to refrain from fully revealing their antagonist until the final acts, surrounded by darkness to both convey suspense and hide the limitations of CGI. Not so in The Host, which has one of the most staggering introduction sequences ever constructed for a monster, all during the bright daylight hours. 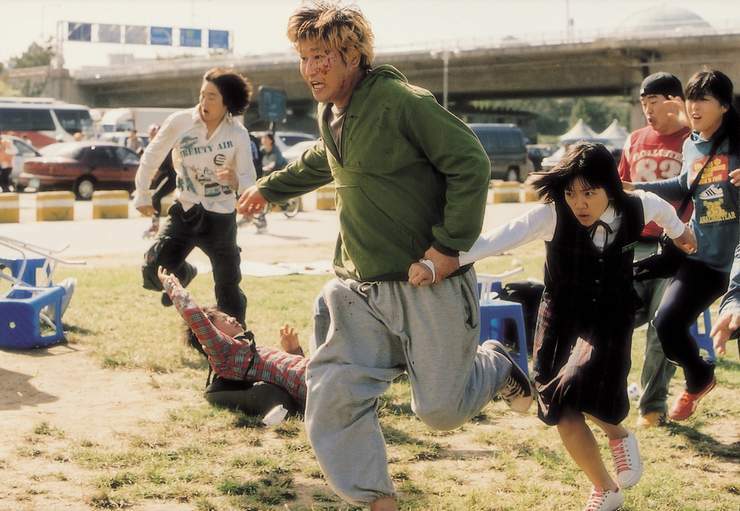 The rampage is truly astounding, and Bong Joon-ho employs a variety of techniques in capturing the the monster’s behaviour and the panic of the crowd. The actors are, as one would expect from such highly talented individuals, perfect in capturing the essence of their respective protagonists, conveying powerful performances that virtually command attention and empathy. With so many narrative devices included, it’s astonishing how each protagonist also manages to evolve throughout the film, leading to a socialist-esque finale in which they all overcome their flaws to fight as one with the proletariat landing the final blow. The Host is an incredible film, and highlights the sheer talent and innovation of all involved. While it is unashamedly mainstream, the film never falls into cliche or parody as is often the case in the genre. Instead, The Host employs layers upon layers of political and socio-cultural subtext that adds phenomenal depth to an already highly entertaining premise, and cannot be recommended highly enough.